Your future Netflix binge sessions could be beamed directly to your eye via a smart contact lens, and the co-founder of the company is all about it. "If virtual reality takes off, we’ll adapt to that. 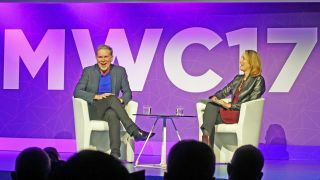 If it becomes contact lenses that have amazing powers, we’ll adapt to that,” said Netflix CEO Reed Hastings at MWC 2017. Netflix-capable contact lenses are theoretical today and not ready for prime time. We haven’t seen smart contact lens prototypes outside of dozens of sci-fi movies – many of which are on Netflix itself. However, the thought of projecting video onto a contact lens is an idea that’s been talked about before, when industry leaders have speculated about the future of mobile. It’s a recurring topic. We’ve also seen Google Smart Contacts tied to medical use. They’re not for entertainment – at least not yet – but everyone’s mind went there as soon as they were announced. What’s important is that Netflix has the willingness to follow new technology trends, according to the keynote comments by Hastings, who naturally cited Black Mirror in his comments. This includes “wearing contact lenses that have all of the world’s information,” Hastings said in a spoiler-free overview of the hit British television series. “What’s amazing about technology is it’s very hard to predict. If you started ten, 20 or 30 years ago, very few people would be able to predict what’s happening today,” he said.